In a current graduate school class, I am discussing the role of the teacher in building student leadership in the classroom. As education is becoming more student-centered, the role of the teacher is transitioning from that of a dominator to a facilitator. The traditional classroom has the teacher providing students with content information, which is typically seen in a lecture or rote learning practice. With the increase of technology, however, many teachers have been exploring differing teaching styles to increase student engagement and ownership in the classroom. Here is a diagram from my graduate school coursework, which provides an outline of various teaching styles and how they affect student motivation, goals, and ownership. As I reflect on these four main teaching approaches, I see that I have employed each at some point in time. 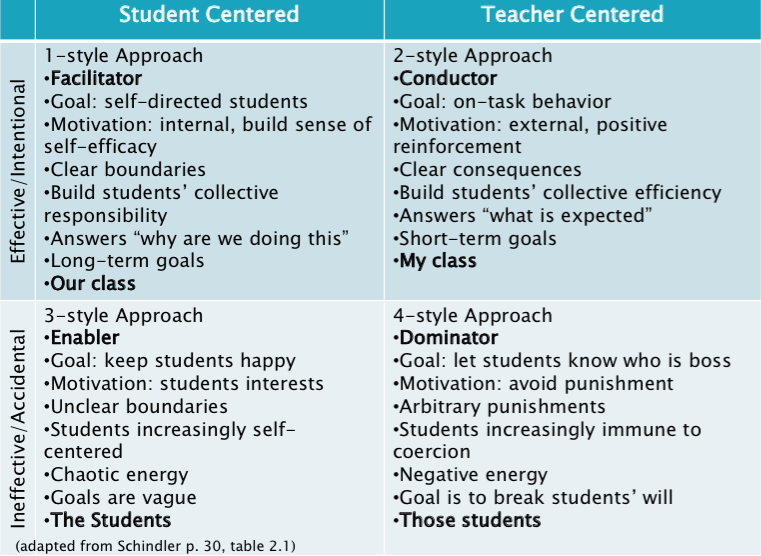 Yes, through this diagram, we see that ultimately the teacher as facilitator seems to be the most effective avenue for students to positively take control of their educational experiences. Students collaborate in taking responsibility of classroom procedures, they internalize the accountability of their work, and they feel a sense of ownership in the classroom. Turning theory into practice, however, can sometimes not be as easy as it seems. There are always external obstacles to overcome such as standardized testing or snow/cold days. These don't have to change the approach we teachers take in the classroom, however, we may have to tap into some of the other approaches, at times, in order to accommodate certain time crunches. Also, each classroom of students is different, and each individual has distinct needs. With the Millennial generation, I have found that some students are more engaged in their learning through newer methods, while some students still prefer the more traditional methods. We are in a time of transition, where some of our students have come from self-directed classrooms and others have not. We as teachers need to be accommodating to all of our students needs, and thus one approach may not work for all students. Personally, I build my classroom over time to reach my facilitator role because I know that this is a new style of learning for many of my students and also so that all of my students are on the same page. I have built my curriculum to transition my students to something new each unit, until I have reached my ideal classroom. I allow Unit 1 for students to become accustomed to using the iPad in the classroom through accessing and submitting course materials to Schoology, writing on .pdfs in Notability, and taking formative assessments on the iPad. In Unit 2, I transition students to watching Educreations videos to access mini lectures for course content. By Unit 3, I begin to establish my goal of an individualized learning model, where students are able to move through the course material at a differentiated pace. I then become more of a facilitator as students move through a self-directed curriculum. Ultimately, you need to determine which teacher role works best for your students and for you. Shindler, J. (2010). Transformative classroom management: Positive strategies to engage all students and promote a psychology of success. San Francisco, CA: Jossey-Bass.